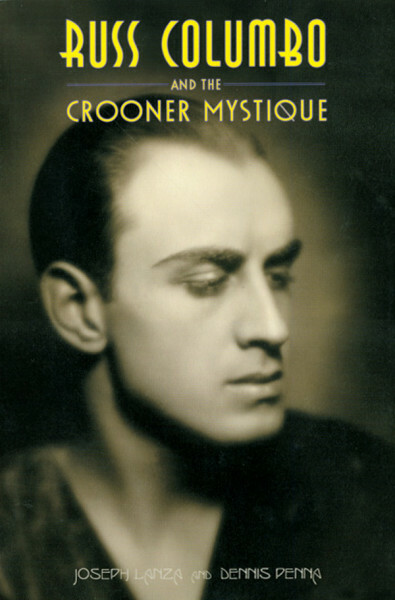 English, Softcover, 15x23 cm, 282 pages, many rare b&w photos; Russ Columbo And The Crooner Mystique: A dashing Hollywood figure rather resembling Rudolph Valentino, crooner Russ Columbo once rivaled Bing Crosby. But he was killed by a tragic, accidental shooting - wasn't he? Lanza and Penna ask that and more in this lushly illustrated book about a filmland sensation of his time. This is the most comprehensive and deeply researched biography of the 'Vocal Valentino' or 'Romeo of Radio' ever written. There are to be found within its 280 pages nearly 200 quotes from diaries, newspapers, magazines, books and booklets plus a list of Columbo's legitimate recordings, radio air checks, compositions, filmography and discography. There are also more than 100 illustrations. We read of other crooners of his-period and of the wheeler-dealer pianist/ composer Con Conrad who became not only Columbo's manager but also his mentor, until their acrimonious split. The so-called 'Battle of the Baritones' is well documented as is the whole of the singer's all too brief career with its highs and lows including the romantic interludes. There is his alleged affair with the silent screen siren Pola Negri; his short-lived romance with the teen-aged film actress Dorothy Dell (sabotaged by Conrad) who was also to meet a tragic death : copies of love-letters from the musical comedy actress Hannah Williams (then the wife of orchestra leader Roger Wolfe Khan) and copies of Columbo's letters to the film actress Carole Lombard, who meant so much to him, as did the photographer Lansing Brown with whom he had a long, ambiguous relationship and who was responsible, however unwittingly, for the crooner's tragic death. Customer evaluation for "Joseph Lanza & Dennis Penna: Crooner Mystic"